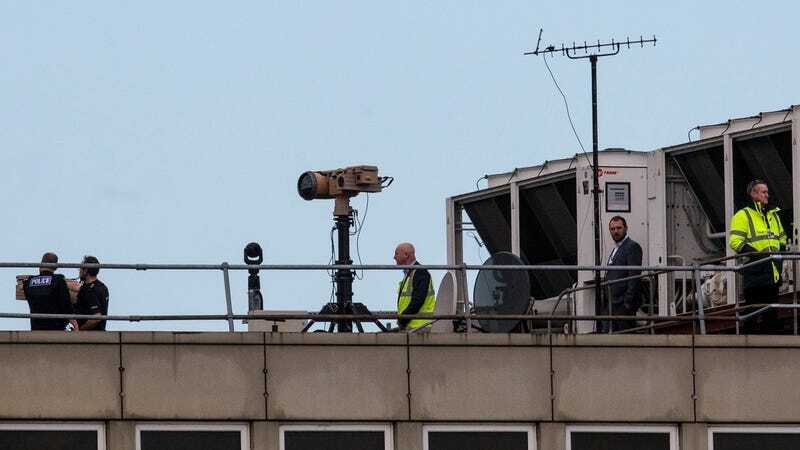 Police officers and other people stand near equipment on the rooftop of a building as the runway is reopened at London Gatwick Airport on December 21, 2018 in London, England. Flights have resumed at London’s Gatwick Airport after a full day of cancellations yesterday due to a mysterious drone that was spotted repeatedly in the area. Flying drones near an airport is illegal because flights are unable to take off and land due to possible collisions. The British military was even called out to search for the drone operator, but they still have no idea who’s behind this deliberate disruption of a major transportation hub. It’s still unclear what kind of drone or drones may be the problem, though the local police have announced that the “devices used are of an industrial specification.” No clear pictures of the drone have been released. Other airports around the world are on high alert because if this is a coordinated disruption it obviously doesn’t take much to put an entire airport out of commission. It appears that all you need is a drone with a sufficiently long range to not get caught. “This is an unprecedented issue. This isn’t a Gatwick Airport issue. It’s not even a UK issue. It’s an international issue,” Gatwick’s chief executive Chris Woodroofe said today after flights resumed, according to the Guardian. “We have been working with technology providers ourselves for the last 12 months but stood here today, there is no commercially available airport licensed proven technology that I could implement,” Woodroofe continued. But police are reportedly trying to use radio signal jammers, just the same, in an effort to stop the drones. The airport is crawling with more police and military than usual, as would be expected. And there have been calls to just “shoot down” the drone, though that’s much more involved than it seems. First you have to catch it. The decision that it was safe to resume flying was taken after police, Army and RAF specialists lined up an armory of counter measures. They included a hi-tech tracking system of the kind used in the struggle to liberate Mosul in northern Iraq, deployed in tandem with “drone killer” equipment that can disable them. New electronic jammers and police snipers armed with Heckler & Koch rifles also form part of the defenses to stop the rogue drone operators threatening the airport again. 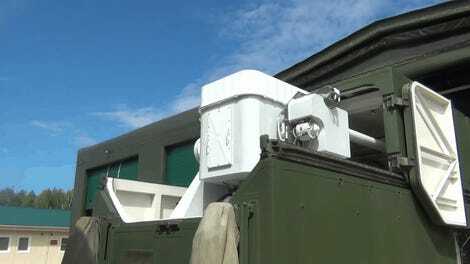 Britain has been a leader in using electronic jamming systems — particularly in detecting and taking out improvised explosive devices — in Afghanistan. Despite the fact that flights have resumed, there are still significant delays and cancellations at Gatwick. As of 12:20pm local time, 7:20am Eastern time, 91 of 412 scheduled arrivals to Gatwick have already been cancelled and 64 of 371 departures to Gatwick have taken place. Authorities are encouraged by the fact that there hasn’t been a drone sighting since before 10:00pm last night local time. “We have made a lot of progress overnight, obviously working hard with our partners and other forces and the airport authority,” Sussex Police official Steve Barry told the Evening Standard. Passengers are understandably upset about the delays, as the weekend before Christmas is one of the busiest times to travel all year. Whoever’s behind the interruption could face up to life in prison, according to British authorities. There are still no clear pictures of the thing though. What are these “military measures”? We’re not quite sure yet.